North Korea China National Day Tour - If you are travelling around China during this time of the year and would like to have a break on the golden week, this is a great chance. The application deadline for this trip is September 1st. You are kindly asked to apply by the application deadline. If you apply after the application deadline we will be able to notify you within 24 hours if your transportation means can be booked on time. Please bear in mind that the Mass Games usually officially take place from August to September 9 (National Day). In the past they have been extended until mid-October although the past two years they have only been extended until the end of September. 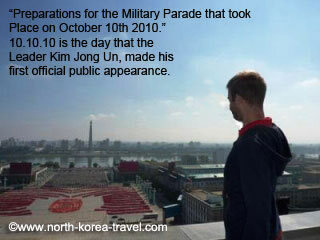 If you definitely do not want to miss the Mass Games then we recommend you to go to North Korea before September 9th. Check in: Ryongang Hot Spa Hotel - resort of cottages located in the outskirts of Nampo. Each room has it's own spa bath tub with natural hot water (which happens to be salty). It is said to be beneficial to one's health and the Koreans recommend not to exceed 15 minutes in a row soaked in the water! Dinner: Ryongang Hot Spa Hotel / optional clam BBQ. The clam BBQ is arranged after dinner. Petrol is used to BBQ the fresh clams. The cost is 5 Euros per person but optional so you can watch and enjoy the night in the open skies even if you are not a big fan of seafood! Nampo Orphanage if opened. If a trip here cannot be arranged we may visit a local mineral water factory. 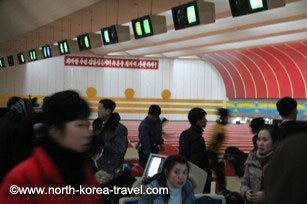 Drive around the city centre and back to Pyongyang. Nampo is an interesting city and change can be seen here with an increasing number of Sino-Korean factories and warehouses. 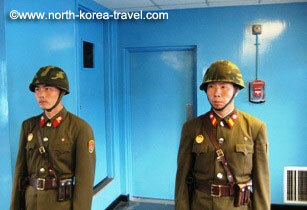 Being a major port city in North Korea it also has a lively vib to it. Golden Lane Bowling Alley - chance to have a bowling and / or pool game and see locals enjoy their Sunday evening. For those feeling nostalgic of the 90s, it's also possible to play retro arcade videogames. Drive to Pyongysong - referred to a satellite city given its proximity to Pyongyang (around 30 to 40 minute drive away) this mining city has only just been opened up to tourism (we have had travellers stay there overnight in the past but 2013 is the first year when our travellers have actually seen sites there). 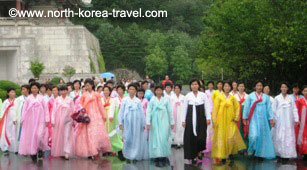 Visit a local factory - you will either go to the Paeksong Food Factory or the Taedongdang Textile Factory. Not many travellers have had the chance to see a factory in one of the capital's "satelite" cities. 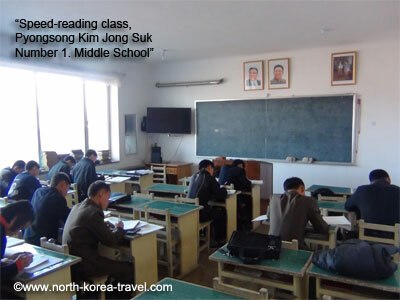 Pyongsong Kim Jong Suk Number 1 High School - the headmaster of the school will show us around. You can join in the classes and speak in English to the students if you wish, a great chance for them to practice their English! Three Revolutions Exhibition Hall - you will be able to see achievements made by Koreans carrying out the the Three Revolutions of ideology, technology and culture. There are halls showing works related to the Juche Idea (central to DPRK politics) heavy industry, agricultural and light industry machinery. There is also a planitarium. Walk around new street - Part of the new skyline built in 2012, you will be able to have an evening stroll and visit a supermarket which locals frequent. 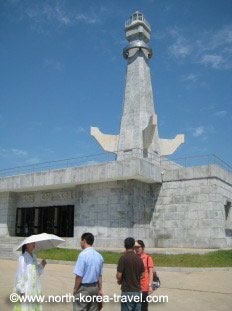 Please go to our North Korea Tourism page to see more information on other tours that we offer other than our North Korea Tour.